Cauliflower Risotto with Chocolate Jelly. This weeks taste sensation comes from a recipe I’ve been meaning to make for ages. When I make a risotto at home I like to make a vegetable puree to stir through it. This acts as the creamy thickener rather than cream or mascarpone. It works brilliantly for pumpkin or pea, not to mention the colour ir creates. I remember watching a programme about 15 years ago and the chef did seven different things with a cauliflower and made the most delectable dish. The chef was my first experience of Heston Blumenthal. Needless to say I have subsequently stumbled across the recipe, these guys at The Big Fat Undertaking went to every last detail to produce the dish. Amazing results were had but it did take three days to make and 5 minutes to eat. I’m pleased to say my version only takes just over an hour to cook. Create a cauliflower stock by bringing the vegetable stock up to the boil with all the cauliflower trimmings. Let infuse for 20mins and strain. Make the jelly. Put 100ml water in a pan with the agar agar, bring to the boil and boil for 3minutes. Loosen the cocoa powder with a little water and add to the boiled agar. Cook for another minute, stir well and add to a container to cool and set. It will set at room temperature. Make the cauliflower puree by adding the florets to a pan with the butter, soften slightly then add the milk and cover with some water. Cook for about 8 mins on a simmer until soft. Puree and add nutmeg, salt and white pepper to taste. For the cauliflower veloute just add equal parts cream to the puree. Start off the risotto, soften the shallot and garlic in the pan. Stir in the rice and deglaze with the wine, slowly keep adding the stock and cook for 18mins. Testing all the time towards the end of cooking time so that its done to your liking. While the risotto is cooking make the coucous by cooking the florets in a knob of butter for 8 mins. Season. Once the risotto is ready, stir in enough of the cauliflower to puree so that the rice falls off the spoon. Heat the veloute to warm, not boiling, and froth with a stick blender. To serve, add the coucous to the centre of a plate. Carefully ladle the risotto over the couscous to cover. Top with chocolate cubes and spoon the veloute around the outside. Make sure you leave enough for seconds!! Thanks Alberto, I love it when an Italian gives me the thumbs up. 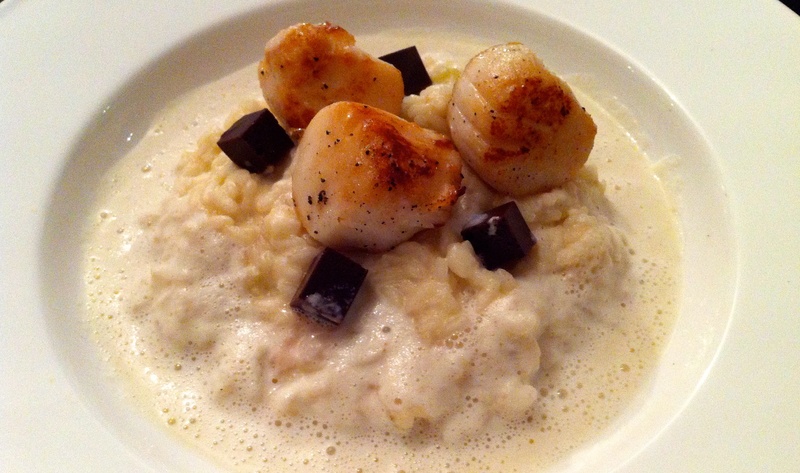 The scallops look perfect on top of the cauliflower risotto. The chocolate jelly cubes are amazing! Excellent meal! Thanks Marta, I’ve just been thinking on my way in from a work a touch of truffle oil would just round this dish of even more. Thanks Rita, if you try it I swear it will be your new favourite. Even better than Risotto alla Milanese. Good lord this sounds good. It looks wonderful and I love the chocolate jelly! Thanks for your comment btw, I responded to it on twitter…not sure if it worked! Beautiful and unique risotto dish. I’m sure the cauliflower adds wonderful (and healthy!) flavor. It was a good use of a much underrated vegetable, a bit like your broccoli and cheddar soup. When are you going to teach the dog to cook?